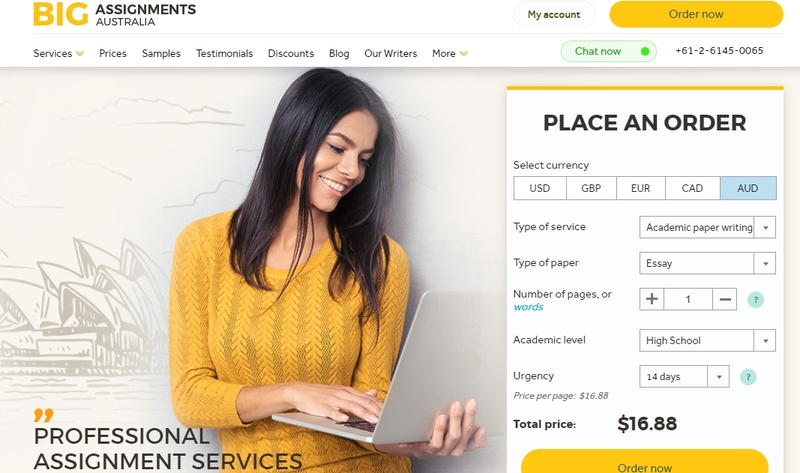 BigAssIgnments gives you a rough idea of your essay price with the quotation tool on its home page. Select your currency, the type of service you want, the type of paper, the number of pages, and the deadline. At the bottom of the quotation tool it will give you the price per page. The starting price for essay work is $16.93 per page, and the maximum price is $62.54 per page. BigAssignments.com uses the standard 275 words per page rule, and they will format the paper as you wish. BigAssignments.com are quite specific about the assignments that they produce. They have a long list of the assignments that they are able to write, though many of them are so vague that it is tough nail down exactly what they do. For example, the “Education” assignment doesn’t state which of the many qualifications that it refers to. They give you a bibliography for free, an outline and a title page. They will format your work for you, and they give you a plagiarism report. The company also gives you limitless amendments, but you should stay clear of any company that doesn’t give you limitless amendments otherwise the writers have a good reason to mess up your essay. To get the 15% discount off your first order, you need to click on one of the discount buttons on their website. They are normally hovering around the bottom of one of their web pages. You may call their phone number that routes you through to a customer support telephone line that gives you scripted answers. The telephone support doesn’t appear to be part of the company, so it may be one of those companies where you buy the services of a call centre. If you email them, then you will receive a reply from them within about 24 hours, and they appear to be from real customer support workers because they have more answers to your questions than the telephone people do. There is also a live chat function that tries to fool you into thinking you are talking to a person, but it takes around 30 minutes for a real person to log in and take over. Up until that time you will find yourself typing in questions to their online FAQ databases.